This house was designed for a client in Sydney’s inner west. The client is a concrete contractor who planned to build the house himself. As a result the house was designed to make maximum use of concrete and solid construction. Because of the client’s heritage, the design was influenced by the materials and forms of Mediterranean Architecture. The curved shell forms reflect the sails of the fishing boats from the Greek Islands. In addition the client does a lot of entertaining and wanted a house which maximized the connection to a large outdoor space. The client’s brief was to create a unique and iconic home. This presented challenges as the site is situated in a fairly homogenous suburban location. As a result, the house has been designed as a series of blocks which modulate the scale and minimize the impact of the house to the surrounding areas. It consists of a series of different internal levels, which step up progressively from the street. The house is quite solid from the street and progressively opens up to be completely open to the rear. These changes in levels created an opportunity for the strongly stepped external massing as well as the complex interplay of the stairs in the central internal spaces. The house has an ‘L-shaped’ configuration to maximize the solar aspect for the living spaces. There is also a central courtyard to the west which allows for light to penetrate the middle of the house and also serves to break up the massing of the facade. A feature of the house is the large central staircase element. The original idea for this stair came from the James Bond movie ‘Never Say Never Again’. This stair adjoins the central courtyard so it is always bathed in light. The stair connects the various level changes in a single fluid sculptural element in dark polished concrete. 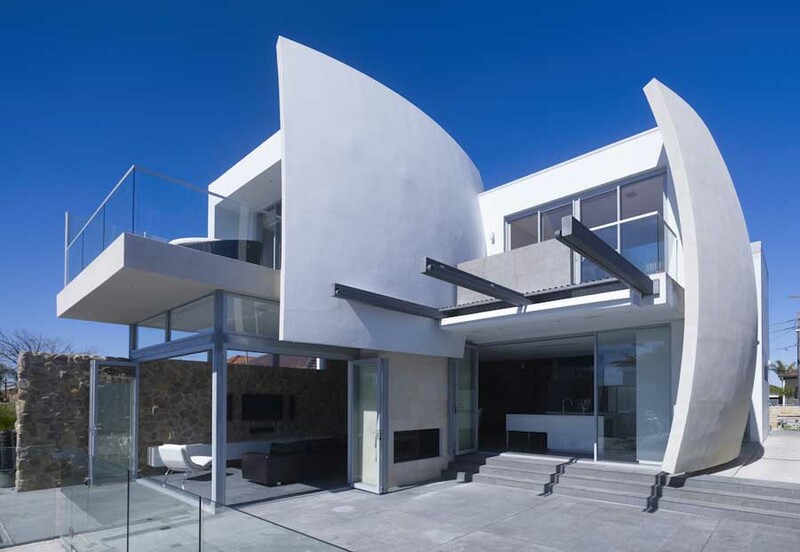 The dominant feature of the house is the curved sail-like rear white walls. These walls soften the massing and bring a lightness to the house. The walls break up the space and progressively dematerialize the house into a series of cantilevered vertical and horizontal planes to the rear. The kitchen and living areas of the house finally dissolve into a large outdoor room for entertaining. This space contains a glass swimming pool with a pool bar and an a minimalist outdoor seating enclosure. This structure has more the feel of a lounge area or bar with reclining daybeds and fabric clad structures. The use of mirrors and chandeliers enhances the luxurious lounge feel. The rear space also contains a terraced market garden which enhances the European character of the space. The living room and outdoor areas are connected by an indoor/outdoor fireplace. The spaces revolve around this element and further blur the line between inside and out. The complex geometries of the curved structures were resolved in 3-D by computer. Like all of our projects, this house, was designed entirely using 3-D computer modelling software. This allows the architect to see the influences of the site and spatial relationships on the design. This technique is called parametric design and you can see in real time how the design changes as you adjust to changing environmental variables.